I thought that the best way for us to start this blog and our journey into God’s Word would be to start with how He brought us to Himself. This is my testimony of how God took a dead sinner and brought her back to life. My parents met at a Bible College. My mom is a preacher’s kid. My dad is the son of a farmer, but when he went to Bible College, he basically became a theologian. We went to church every Sunday, Wednesday, and every Bible study and prayer meeting. Basically, if the doors were open, we were there. It was a few days after that I began to realize I needed to get serious with God. I felt that He didn’t love me and I told Him I couldn’t worship Him if He didn’t care about my physical needs. Sure, He could provide joy and peace and whatever but that wasn’t going to pay the bills, that wasn’t going to get me to work, that wouldn’t fix my families problems. I needed to know He would take care of my physical issues and not make me fend for myself. I decided I was going to fast and pray until He made Himself known to me. I refused to live a life without Him, but I also refused to live a life without Him being there for me. I fasted and prayed for 7 days. Around day 4 of my fast, I was kneeling on my living room floor in front of my couch, after everyone had gone to bed. I started to pray, and by pray I mean cry and groan and beg God to hear me. At some point, I just started to ask Him what He wanted out of me. What in the world did I have to do to get Him to love me? As far as that goes, was I even a Christian? What do I have to do for you to save me, God? I’ve done everything I know to do, but you won’t save me! I don’t understand! What do you want!? What do I have to do?! It was at that moment that I realized, I didn’t need to do anything. Jesus had done everything that I needed to be saved! All I needed to do was believe that. And I did! For the first time, I really understood what it meant that Jesus had died for me! I started to repent of everything that I had ever done that I could think of. I began to praise Him for all He had done for me and for washing my sins away. For the first time in my life, I felt free and alive, and I knew that God loved me! The last three days of my fast were spent praying that God would help me with my problems but ultimately handing them over to Him, telling Him that I was ok with whatever His plan was for me. If He didn’t fix all of my problems, it wasn’t because He didn’t love me but because He had a better plan than mine and I was ok with that. I trusted Him. About three days after my fast had ended, God performed a miracle, He did answer my prayers and fixed my most pressing physical problems most unexpectedly. It was at that point I broke down crying cause I couldn’t believe that God would still do that for me after I had thrown such a tantrum and had questioned His love for me. He was so merciful to me. He forgave me when I certainly didn’t deserve it, and He was proving His willingness and ability to care for me. I started digging into His Word and looking to know Him more. I couldn’t hardly put down my Bible. All of my spare time I was reading the Bible, or studying it, or listening to sound teaching of it on the internet. At some point, I realized that I fell more into the Baptist denomination than what I had grown up in. I’m currently attending a Southern Baptist Church with my family, although we consider ourselves Reformed Baptist. We love our church and our pastor. My husband got saved a couple of years after I did and we work together to teach our kids about God and His amazing work in our lives. We still stumble a lot. Like, a lot and we are far from perfect or even picturesque but His grace is sufficient, and His mercy never ends. We can see how He is growing us and we see how our failings drive us back to Him. I wanted to start this blog because I am a busy woman and I know a lot of working women. I was blessed enough to grow up with parents who loved me and who were able to teach me about God, but I know a lot of women who weren’t given that same blessing. I see a lot of women who have questions, who don’t know the Bible very well and struggle with the basics because they were never taught and now they are older and have been a Christian for a while, and it seems silly to ask, or they don’t know where to go for answers. I want this to be the place where women can be safe asking their craziest, “silliest” questions. Like, “who was Noah?” “Wait you mean there’s a guy named Lot?” “What is regeneration?” Or “How do I know if ____ is a sin?” For new Christians, old Christians, and everything in between. I want to help you learn about the Bible, about God, and see the glory of God displayed in your life. Come join me as we endeavor to know God and understand His Word. 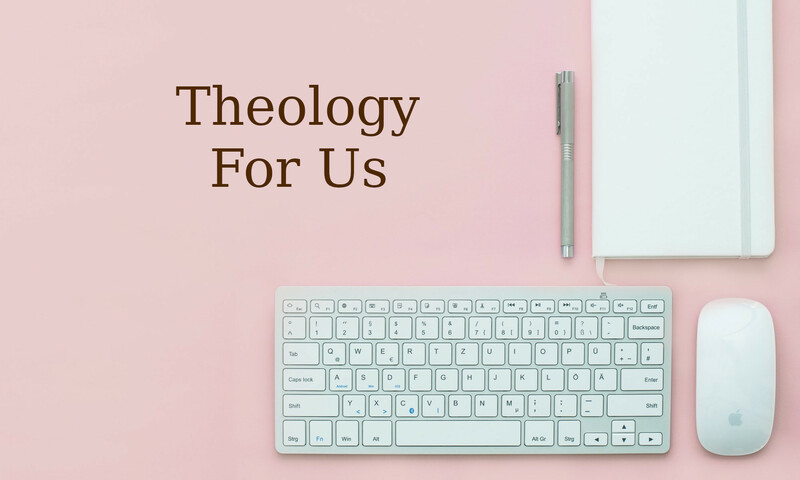 Follow me on Facebook, Instagram, or Twitter at theologyforus or send me your questions and comments at theologyfortherestofus1689@gmail.com. Next PostNext Who is God?